The third edition of Live Cinema Festival will take place in Rome from September 8 to 11, 2016 in MACRO – Rome’s Contemporary Art Museum in Via Nizza with an Audience Development conference on 7 of September. This year, Live Cinema Festival wants to highlight how new technologies, often seen as mere new tools, really contributed to change the way whereby artists approach to the creation itself. New media indeed can remodel and recode the sense of an aesthetics itself, revealing a new creative technique which is declined to various applications – for example also through the use of analogic technologies in an innovative way. The festival aims to offer to the audience an overview of different ways of interpreting Live Cinema, from the analogic of the 16 mm projectors to the last digital experiments, through 8 international artistic groups’ performances with 15 artists coming from: Hungary, Poland, United Kingdom, Netherlands, France, Germany, Austria, Czech Republic and Spain and more than 30 artists participating to the screenings and a selection of the most interesting roman DJs for the opening appetizers for a total of more than 50 artists. The chosen location for the third edition is MACRO – Rome’s Contemporary Art Museum, and this will be an interesting example of dialogue between historical heritage and contemporary architecture which, with its strong vocation connected to the world of innovation and artistic experimentation, it’s surely the most suitable setting to host an artistic-cultural exhibition with a young and innovative character, aiming to offer a free and high quality cultural offer to Via Nizza neighbourhood and to the city of Rome. The third edition runs over 4 days from September 8 to 11 and the everyday opening – from 19:00 pm – will include a musical appetizer curated by several selected partners among the most interesting and innovative roman organizations, Female Cut, Butter, Strati ed Amen. Moreover, from 19:00 pm MACRO’s Auditorium will host Screenings, a selection of documentaries, interviews, backstage and performances of Live Cinema that will to offer to the audience a wide and comprehensive image of this new discipline. From 22.00 in the MACRO’s foyer we will have the festival’s core with 2 live performances every day by 8 international artistic groups composed of 15 artists from Hungary, Poland, United Kingdom, Netherlands, France, Germany, Austria, Czech Republic and Spain. On Wednesday, September 7 – one day before the opening – at 16:00 pm the “Av Audience Development” Conference will take place: here a network of roman organizations active in the fields of digital culture, will meet local institutions. 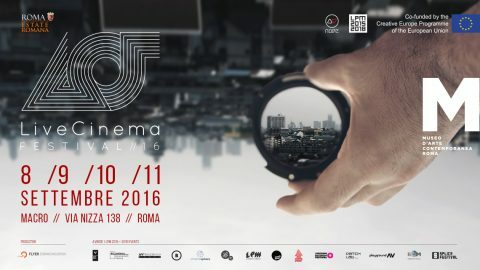 Live Cinema Festival 2016 is supported by Roma Capitale, in collaboration with SIAE, and it’s part of ESTATE ROMANA – “Roma, una Cultura Capitale”, 2016 edition. Live Cinema Festival is produced by Flyer Communication with the sponsorship of AVnode Network, the Netherlands Embassy, the British Council, the Czech Cultural Institute, FLxER.net, Free Hardware Foundation, Cervantes Institute and Linux Club Italia.